The computation of presidential election results filed before the elections petition tribunal by the presidential candidate of the PDP, Atiku Abubakar, shows that all accredited votes cast in 33 states of the federation were shared between him and President Muhammadu Buhari. However, excerpts of court filings published by PT give Atiku’s state by state breakdown of votes which, he claims, placed him ahead of Buhari with 18,356,732 against the incumbent’s 16,741,430 votes show several flaws. The result is exclusive of figures from Rivers State. According to Premium Times, Atiku’s purported result implies that no invalid votes were recorded in the 33 states, and none of the 71 other presidential candidates obtained any score. In three states; Abia, Bauchi and Cross River, the documents show that the two candidates collectively got votes higher than the number of accredited voters. Mr Abubakar claims that he obtained the results from the server of the electoral commission, INEC. The document is included in the petition filed by Mr Abubakar in a suit seeking his declaration as the validly elected president. The purported result shows that Mr Abubakar defeated the incumbent president by a margin of 1.6 million votes. Contrary to Mr Abubakar’s computation, INEC’s official result obtained from the electoral commission’s website show that all the 73 candidates who participated in the election scored some votes. The result showed that 71 other candidates in the election shared the remnants of 869,758 valid votes collated. The person who came a distant third in the election, Felix Nicholas, of the Peoples Coalition Party (PCP) scored a total of 110,196 votes. He was followed by Obadiah Mailafia of the African Democratic Congress (ADC) who polled 97.874. 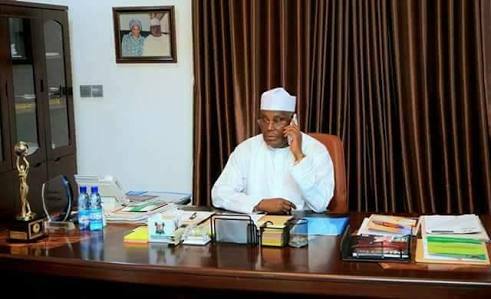 The Atiku resultIn Mr Abubakar’s home state of Adamawa, where INEC officially declared Mr Abubakar winner with 412,266 against Mr Buhari’s 377,488, Mr Abubakar claims that he got 646,080 out of the total 815,680 accredited voters with Mr Buhari scoring 161,600. The result show only the two got all the possible votes. In Akwa Ibom, Mr Abubakar and Buhari, according to the computation, received all the votes by the 925,370 accredited voters with Mr Abubakar polling 587,431 votes ahead of Mr Buhari’s 337,939. It is another clean sweep in Enugu as Mr Abubakar claimed that the state’s 965,940 accredited voters gave him 698,119 as against 267,821 for Mr Buhari. The 1,169,303 voters accredited in Sokoto State, according to the purported result, all shared their votes between Mr Abubakar (552,172) and Mr Buhari (617,131). Mr Abubakar’s 442,380 votes allegedly polled in Taraba and Mr Buhari’s 188,389 votes put together represent 630,769 total accredited votes for the state. In Zamfara, the result shows that total accredited votes of 792,796 were shared between Messrs Abubakar and Buhari with the former having 379,022 while the latter got 413,774. Aside the exactitude between summation of figures for the two candidates and the number of accredited voters, there are other issues that are either arithmetic errors or over voting. In Abia, for example, 853,050 were recorded as “accredited voters (actual)” but the sum of the votes allotted to Mr Abubakar and Buhari alone, outshot the accredited voters by 10,000. Mr Abubakar, according to the result, polled 664,659 while Mr Buhari obtained 198,391. It is a similar case in Bauchi, where the total for Messrs Abubakar and Buhari’s purported votes outnumber total accredited voters by 287 votes. Mr Abubakar claims 187,668 votes a far cry from 854,037 the document said Mr Buhari obtained. The summation comes to 1,041,705 while the document gives the total accredited voters as 1,041,418. In Cross River, the document shows that votes obtained by the two leading candidates amount to 691,640 which is higher than the 690,890 accredited voters’ figure by a total of 750 votes. So, who are those investigating the 'irregularities' in Atiku's camp that couldn't take time to sort it right?